In our last blog post, we discussed Dr. Petti’s presentations on Cellulaze™, Smartlipo™, and PrecisionTx™ at THE Aesthetic Show™ 2014. In today’s post, Dr. Christine Petti will explain some of the benefits of laser-assisted contouring of the lower face and neck with PrecisionTx™. 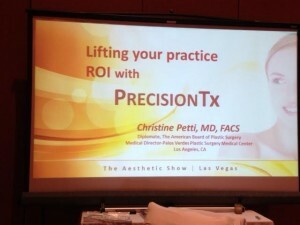 In my recent educational lecture on PrecisionTx™ at THE Aesthetic Show™ 2014, I helped other physicians in the field of aesthetic medicine learn how they can use this treatment to benefit their patients. Based on the laser technology and clinical research, PrecisionTx™ is a great option for patients of all ages. It is minimally-invasive, and it fits the requirements of the modern man and woman who want to get back to their lives quickly, yet desire to maintain their youthful appearance in the long-term. PrecisionTx™ can also be good for younger patients who may have a genetically determined thick and full neck. These patients are not overweight, but simply have a body contour that creates this full and heavy neck anatomy. The procedure typically takes about an hour, and patients should start to begin to see a gradual lift in the following days. Patients can go back to work in a day or so, but may have some bruising to cover up. All and all, patients young and old have found their results to be rewarding and life-changing. If you have questions about this procedure, or if you would like to schedule a consultation with me, please contact us today. I look forward to meeting you and helping you achieve your aesthetic goals!